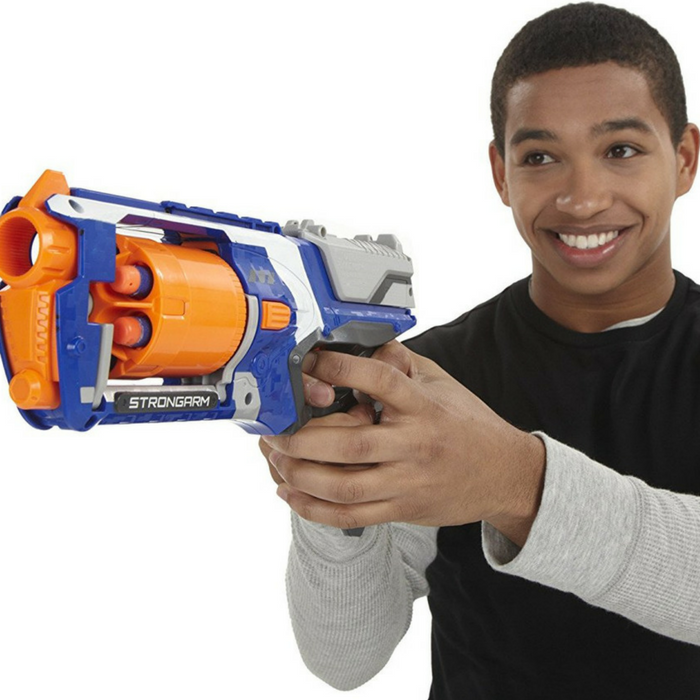 Nerf N-Strike Elite Strongarm Blaster Just $12.99! You are here: Home / Great Deals / Amazon Deals / Nerf N-Strike Elite Strongarm Blaster Just $12.99! Looking for a gift item this Christmas? Amazon is currently offering this #1 Best Seller Nerf N-Strike Elite Strongarm Blaster for just $12.99 PLUS FREE shipping with Amazon Prime or for orders over $25! Speed and mobility are yours with the quick-draw fast firing of the Strongarm blaster! It has the same long-range power as other N-Strike Elite blasters (sold separately), firing the 6 Elite Darts up to 90 feet. Hold the trigger down and pump the Slam Fire handle repeatedly to rapid-fire all 6 of your darts at your target! Loading is easy and quick with the flip-open rotating barrel, and you can attach most N-Strike accessories (sold separately) to the blaster’s Tactical Rail for even more battle advantage. Add the Strongarm blaster to your arsenal and unleash a storm of darts at your target! This is a great gift for Christmas!